Species 6, natives of the Old World. Besides the following, two others have been found in ballast fillings about the eastern seaports. 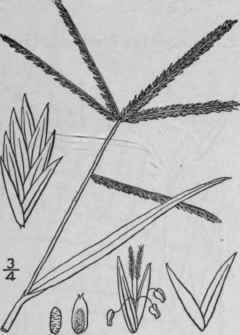 Type species: Cynosurus coracanus L.
Cynosurus indicus L. Sp. PI. 72. 1753. Eleusine indica Gaertn. Fruct. & Sem. 1: 8. 1788. Culms 6-2° tall, tufted, erect, or decumbent at the base, smooth and glabrous. Sheaths loose, overlapping and often short and crowded at the base of the culm, glabrous or sometimes sparingly villous; ligule very short; blades 3-12' long, 1"-3" wide, smooth or scabrous; spikes 2-10, l'-3' long, whorled or approximate at the summit of the culm or one or two sometimes distant; spikelets 3-6-flowered, 1 1/2"-2" long; scales acute, minutely scabrous on the keel, the first 1-nerved, the second 3-7-nerved, the others 3-5-nerved. In fields, dooryards and waste places all over North America except the extreme north. Naturalized from the warmer regions of the Old World. Dog's-tail or Goose-grass. Crop-grass. June-Sept.